Fruit and Vegetables Archives - Surfing Hydrangea Nursery, Inc. I hate growing tomatoes. 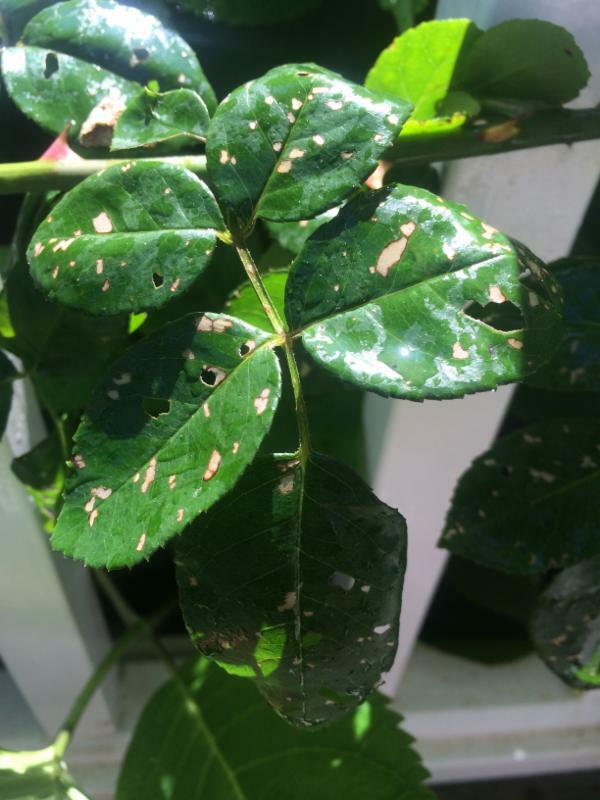 They seem to get every problem that plants can get: early blight, late light, anthracnose, grey mold, damping off, powdery mildew, nutrient deficiencies, tomato horn worms, aphids, nematodes, spider mites … the list seems endless. 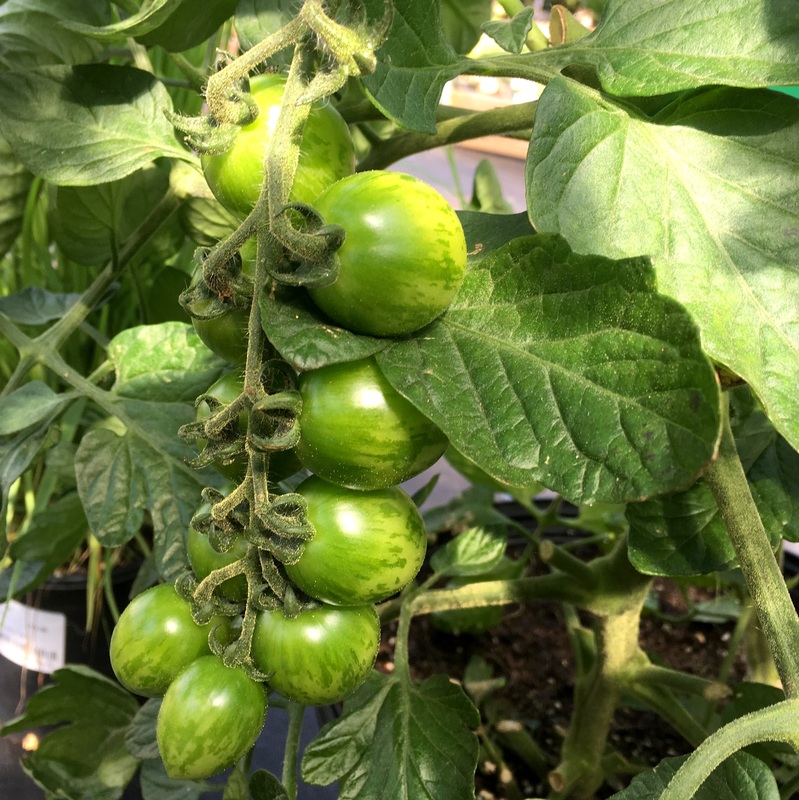 That being said, every year we have a few tomatoes left over at the nursery that find their way into large pots for staff enjoyment. 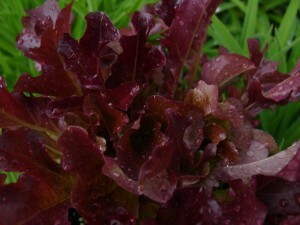 They are most often neglected and the harvest is minimal if any. But once again, I’ve gone for it. We have some ‘Green Zebra’, ‘Sungold’, ‘Cherokee Purple’, ‘Chocolate Sprinkles’ and ‘Lemon Boy’. I’m determined to have a bumper crop this year! I am by no means an expert on tomato culture, but I have done a lot of reading over the years. I’m still a little stymied when it comes to the perfect nutrition for these plants, but when it comes to training, I think I have it down. We’re lucky to have a greenhouse at the nursery. Growing these veggies under a roof seems to be making a big difference already. Here is my set up: I tied a thick length of twine to one of the purlins (supporting pipes) that runs down the length of the greenhouse and allowed it to dangle down to the plants in each pot. Next I tied each plant to the twine, with a loose figure eight knot using some flexible tape. I planted two tomatoes in each plastic nursery pot, super deep. Then I filled them up with nursery growing mix and some slow release fertilizer to get them going. If left to their own devices, these plants would sprawl on the ground, forming a tangled heap with smaller, lesser-quality fruit. Judicious training and pruning should encourage fewer, but higher-quality, tomatoes that are held close to the support and easy to pick. Proper pruning also maximizes air flow and sun exposure as well, hopefully reducing fungal infections. As the plants grow, I select two leaders and continue to tie them loosely to the twine support as they grow. I prune away any other shoots. I have continued to prune the vines every week. 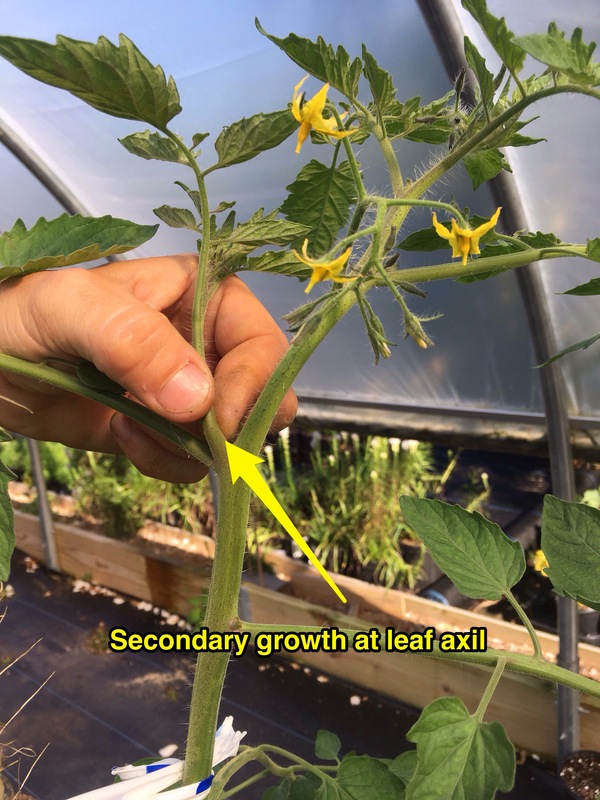 Most of the growth is at the tip of each leader, but there are also many side shoots that emerge from the leaf axils along the vine. I pay close attention to those shoots and pinch them off when they are a few inches long. 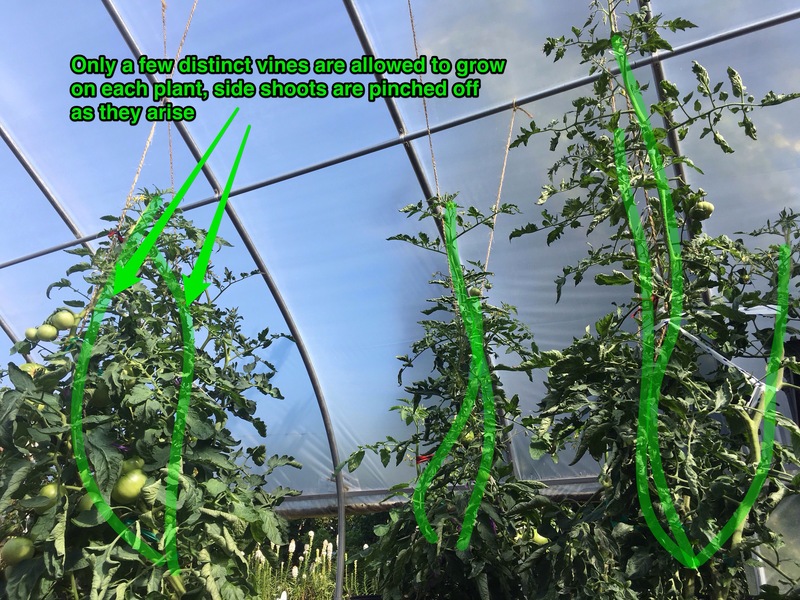 If I miss a few, and their diameter increases, I use my pruners so that I don’t damage the vine trying to tug them loose. We sell hundreds of ornamental trees on Nantucket every year. And as much as I love selling majestic Elms, elegant Styrax and the like, I have a special place in my heart for fruit bearing trees. There is something really exciting about being able to grow fruit for yourself. Pear trees, in particular, seem to be very rewarding. Pears grow well when planted in full sun in average to fertile soil that is well drained. 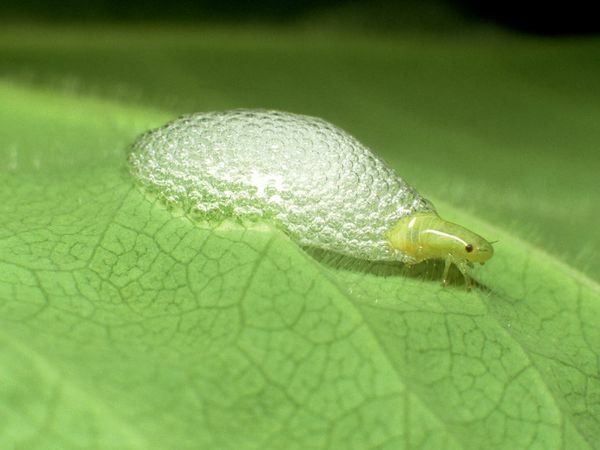 Like other fruit trees, they require a little care and benefit from a spray program to control certain pests. But if well cared for, a good crop is within the reach of any home gardener. Similar to apples, European pears require more than one variety to ensure proper pollination. If a pollinizer is not planted within 100 feet of the desired variety, the crop is likely to be very small or non-existent. 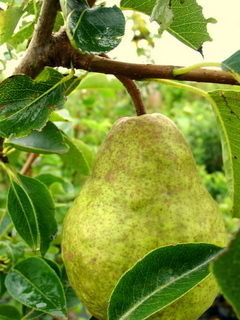 The standard pear for flavor and texture is ‘Bartlett’. This variety is properly pollinated by ‘Bosc’. ‘Sekel’ another common variety, will not pollinate ‘Bartlett’, so be sure to add a third variety to your yard if you want to try ‘Sekel’ as well. All that being said, Asian pears are self-fruitful. So if you only have room for one fruit tree, try an Asian pear. These are the round, brown varieties that are found year-round in the store. They tend to be very crisp, but have less flavor than European pears. Although less hardy than their European cousins, they should do well on Nantucket due to our mild winters. Standard pear trees can get quite large. Luckily, the fruit trees we sell are generally semi-dwarf. This means that one can expect our fruit trees to mature at about 20 feet. The smaller size makes these trees easier to spray, prune and harvest. Backyard fruit and veggie gardening is a big trend in gardening these days. It’s a real treat to pick your own blueberries instead of buying them from the Stop and Shop at $5.00 a quart! They are easy to grow and delicious eaten right off of the bush, or with cream and sugar after dinner on a warm July night. There are two basic types of blueberries, high bush (Vaccinium corymbosum) and low bush (Vaccinium angustifolium) (there are also half-high varieties, but lets not get into that right now). Low bush blueberries are the kind that I grew up calling “Wild Blueberries” in Nova Scotia. They grow along the ground forming a dense groundcover less than a foot high. The fruit is small and flavorful, but somewhat of a hassle to harvest. I will never forget my first summer job hand-raking blueberries. My brother and I were bussed out to the country where the fields were all marked off into rows for picking. The blueberry rake looks much like an old fashioned cranberry rake. It’s a metal box with lots of tines close together on the bottom and a handle on top. The entire day is spent bent over scooping up berries and pouring them into buckets to be weighed. We were paid by the pound, but at the rate we picked, I’m not sure if we averaged any more than thirty dollars a day. I don’t quite remember how long it took for us to be fired, but I know it wasn’t longer than a week or two. Lets just say, I wouldn’t make a good itinerant fruit harvester. High bush blueberries are more shrubby, growing up to six feet tall. They produce a crop of large berries held off the ground on the tips of the branches. Blueberry bushes are not self-fruitful. In order to get a good crop it is important to plant at least two different varieties close to each other. It’s also important to pay attention to when the cultivars flower – early, mid or late. In order to cross-pollinate, all the bushes must be in flower at the same time. Try not to plant only one early and one late variety, as they might not overlap flowering period. Have you ever noticed the difference between an apple you buy at Stop and Shop in June and a fresh-picked Massachusetts-grown apple in September? It’s remarkable how much better the flavor and texture is this time of year! If you are tempted to plant your own, why not take the opportunity to sample the range of fruit that might be available to plant. Space: An un-grafted tree grown from seed can reach 20′ tall and wide! With modern grafting techniques, however, pomologists can control the size of the tree. Dwarf and semi-dwarf trees are generally preferred for growing apples at home. Or, consider an espalier (A tree trained flat into a formal shape) these can be planted on a wall, or a post and wire system. Exposure: Fruit trees need lots of sun to produce! If the spot you have selected for you tree doesn’t have full sun, its unlikely that you will get a good crop of apples. 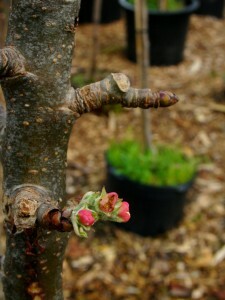 Pruning: Apples require yearly pruning to produce the best crop. If you love pruning, apples are a lot of fun! It’s a good idea to follow a reference, Umass and Cornell have great extension services that have excellent websites. Take a peek at http://www.gardening.cornell.edu/fruit/homefruit/3treefruit.pdf and www.umass.edu/fruitadvisor/pdf/RINLA2011.pdf these are both great resources for apple culture. Pest & Disease issues: All fruit trees are susceptible to a myriad of pests and diseases. To limit the amount of spraying needed to produce quality fruit, always plant cultivars that are touted to be resistant to those problems. Pollination: Apples are not self-pollinating. This means that in order to set fruit, more than one variety must be planted that blossom at the same time. Do your research! Make sure the varieties you chose to plant overlap their bloom period, otherwise its possible neither tree will bear fruit. Harvest Time: Depending on the variety, apples will ripen and can be harvested from late August all the way until frost. Consider planting varieties that will provide fruit in succession. Use: Choose varieties that suit your needs. Do you like to make apple sauce and butters? ‘McIntosh’ and varieties like it are ideal for that purpose. ‘Braeburn’ makes a great pie. ‘Jonamac’ is delicious eaten out of hand. Cider is another great way to enjoy apples, try combining varieties to create a ‘House Blend’. We stock many apples at the nursery, and are happy to source individual varieties you might be interested in. Whether a mature tree is needed for your project or a young containerized plant is ideal, we can provide a plant that will fit the need. Can there be anything better than eating a plump berry at it’s peak? Supermarket fruit can’t compare to ripe berries picked and eaten out of hand. No wonder more and more people are growing their own! Most berry bushes require no more care than landscape shrubs. Apart from annual pruning, there is not much in the way of work to be done to keep them productive. Just plant them in full sun, and plan on a bountiful harvest this summer! 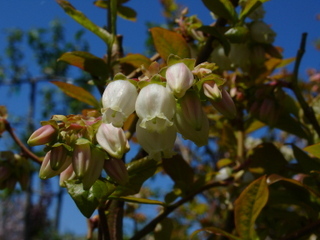 We have both high and lowbush blueberries in stock and are expecting some 5-6′ Highbush Blueberry ‘Elliot’ next week. 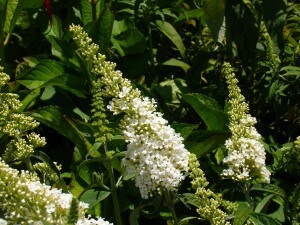 This late variety is a vigorous plant that performs very well in our climate, while producing a heavy crop of berries. We also have a wide aray of Raspberries, Blackberries, and Gooseberries for you to choose from, that will provide you with the highest quality fruit for years to come. In the rose family, the genus Rubus includes cultivated red, golden, purple and black rapsberries as well as blackberries. Homeowners and landscapers alike can be confused about pruning these berries. 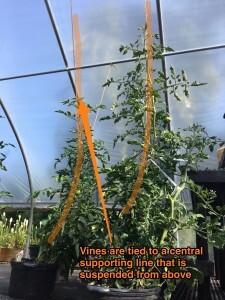 Consider growing these plants on a wire trellis system to promote good air flow and facilitate training. 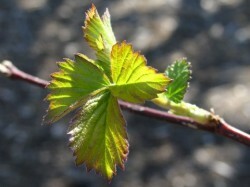 Blackberries grow long arching canes that are often very lengthy and thorny. The fruit is borne on canes that are more than one year old. However, the most productive canes are not older than three years. In March, remove the oldest canes at ground level, in favor of the younger ones. Cut back any lateral brances to six or eight inches. Head back canes to 6″ above the top wire. In summer, tip back new growth to 6″ above the top wire to encourage lateral fruiting branches. Raspberries produce upright canes that are generally shorter than blackberries. Most types of raspberries are summer-fruiting. The fruit is borne on canes that have overwintered from the previous season. These second-year canes will flower, fruit and then die back to the ground. In March, remove any dead, damaged or spindly canes at ground level. Some raspberries are fall-fruiting. These types produce canes that will flower and fruit at the top part of the cane in the first growing season. Over the winter they will die back somewhat, but will then flower and fruit on the lower cane portion in summer. After this second fruiting, the entire cane will die. The best way to maintain these types is to mow all canes to ground level in March. This will produce a single crop in the fall.